Thought this layout would be more interesting than my original draft of layering Selkie's first few lines of dialogue over two or three panels of Truck climbing stairs. I know it like I know fire and peanuts? It’s a classic school science project. I remember doing it myself. My school must not have been classic. 😛 Never heard of it before. And the realization that she can trap Truck dawns in Panel 5. No, I think the “sting” was her somehow collecting evidence of what happened in the yard. She was pretty confident that she’d beaten him even before he started coming up the stairs. I think this is the “scare the bejesus out of him by showing her fangs” part. I’m still sensing a shriek that causes ol’ Tommy-boy to have some yellow socks. Especially if it’s dark back in the stacks. We should be so lucky. With the way the principal has been dealing with things so far, Selkie will likely get thrown out of the school and Jessie fired. What dramatic stair-climbing am I trying to remember right now… ? I think THIS is what you’re looking for? I think THIS is what you’re thinking of? Man started on last Tuesday finally an the latest page now I have to wait til Friday for a new update. I dont get what she is trying to do here. I don’t understand. I just did some rummaging around through the archives, and I haven’t found any mention of screeching. Where did you get that idea from? Start here. 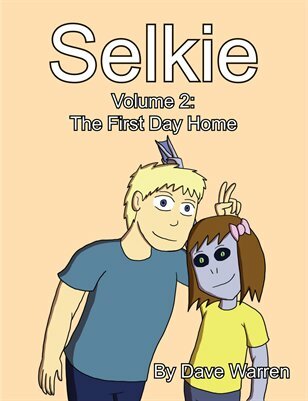 https://selkiecomic.com/comic/selkie273/ and read the next few. 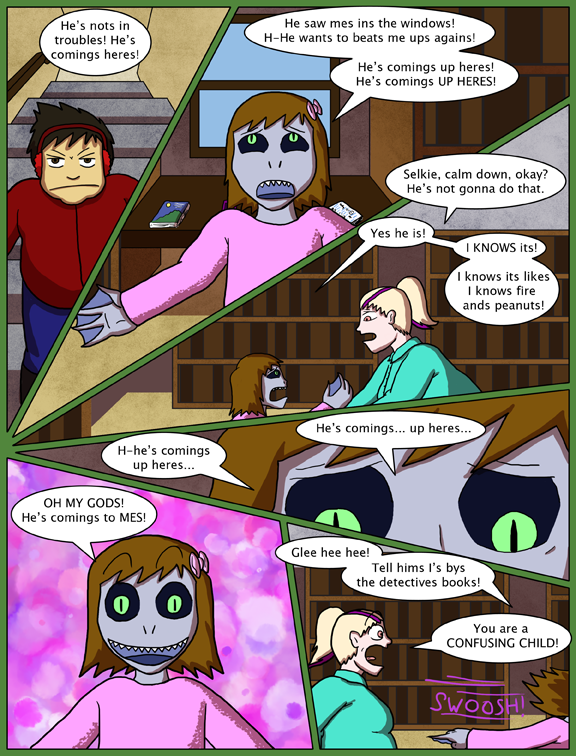 It mentions it in this one https://selkiecomic.com/comic/selkie276/ but if you start a few strips earlier it’s easier to understand. Finally caught up! I lost my bookmark/favorite/whatever of this comic when my computer went kaput a year or so ago, and had forgotten about it until it popped in my mind a week ago. Glad to be back! I wonder if she wants to use whatever the special something Todd bought her to protect herself with…. Actually, I’d like to see Truck laying on the floor twitching, as she sticks her stun-gun back in her pocket and calmly walks out of the stacks.